As a homeowner, it’s up to you to keep your home neat, clean and tidy. Whether your home is cozy or sprawling, it’s important to stay on top of things. If you put off routine cleaning until the last possible second, you’ll have to tackle the whole house at once. This is sure to make you feel overwhelmed, which could make you put it off yet again. A good way to avoid this vicious cycle is by creating a cleaning schedule and sticking with it. It also helps to have a clear set of steps for cleaning every room in the home. You should set aside a few hours per week for cleaning your home. Make a pattern and stick to it. For instance, your pattern might be to clean the family room, kitchen, bedroom and bathroom. By following that pattern every time, you won’t overlook anything. The nice thing about handling things this way is that it gives you some flexibility. When you have a spare hour or two, pick up where you left off. Perhaps you had to stop in the middle of cleaning the bedroom or were about to tackle the bathroom. Just proceed as planned when you have the time. In the event that you are interrupted while cleaning a room in your home, it’s smart to have a list of steps to follow. You will easily remember which step you were on when you were interrupted and will be able to pick back up again without any issues. Once you’ve followed the same steps a few times, doing this work will be like second nature. 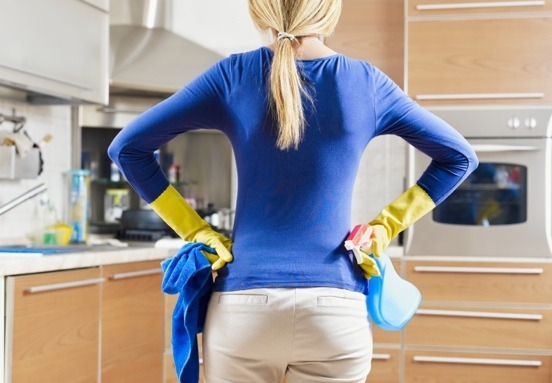 The routineness of following simple steps makes cleaning seem a whole lot easier. With a clear plan in place, you should never feel overwhelmed. One reason that people fall behind with their household chores is because they try to tackle too much at once. With your lists in hand and a rough pattern to follow, you should never feel under pressure. When you have a little extra time, go to work on the next room on your list. Complete as many steps as possible. A good rule of thumb is to order the steps from easiest to most difficult. At the very minimum, you will be able to tidy up a room. At the most, you will have it sparkling from floor to ceiling. This is the room that most people put off, so it should be first on your list. As tempting as it may be, don’t skip this when it comes up in the rotation. You may have more than one bathroom. If so, do the bigger one first. If there’s one room where it pays to put in a little extra effort while cleaning, it’s the bathroom. By staying on top of it, you will never have too big of a mess to tackle. When the sinks and mirrors are grimy, the whole bathroom looks filthy. Wipe them down with flushable sanitizing wipes. As far as the sink goes, concentrate your efforts on the seams where the faucet and handles meet the sink. The seam where the sink meets the counter can also accumulate a lot of grime, so focus on that spot as well. At the very least, you should use flushable sanitizing wipes on the toilet seat and on the edge of the bathtub. This will make things sparkle, shine and look a lot cleaner. The next thing on your list should be to clean the toilet bowl well. First, squirt some toilet bowl cleaner into the bowl and let it sit for at least five minutes. This will give the chemicals time to loosen the grime. Use a toilet bowl brush to scrub the bowl thoroughly. It’s amazing how quickly the bathroom floor can get grimy. Before mopping it, use an electrostatic mop to pull hairs from the floor. You can then either squirt all-purpose cleaner on the floor and mop it up, or you can use a bucket and regular mop to do the work. This is the step that requires the most elbow grease. In the case of lime scale, which makes glass doors look cloudy, use lemon oil. For mildew and mold, plain hydrogen peroxide is sure to do the trick. Just apply it and let it soak for at least five minutes. Scrub the affected area with a grout brush. Make sure to wear gloves the whole time. Despite spending a significant amount of time there, people are often reluctant to thoroughly clean their kitchens. Considering the fact that it’s where you prepare food for your family, it’s important to keep this room under control. After cleaning the bathroom, you should plan on tackling the kitchen. As with all of the rooms in your home, keeping up with things is key. As long as you perform the following steps regularly, you should never have to face a hideous, time-consuming mess. Cleaning the kitchen will never be fun, but doing it regularly will make it tolerable. As tempting as it may be to clean around small appliances and other things that are positioned on your kitchen counters, you should move them out of the way first. Move them over to the kitchen table or put them on the floor. You’ll be amazed by the crumbs and other debris that accumulate beneath coffeemakers, microwaves and other appliances. It’s a lot easier to wipe down the counter when these things are cleared away. One of the dirtiest parts of the kitchen is the sink. After it’s soaked for at least 10 minutes, scrub it down thoroughly. After that, rinse it a few times with cold water. Make sure to clean the faucet and handles too. Quickly sweep the kitchen floor. If possible, use a dry mop to get stubborn hairs and dust from the floor too. When time permits, spray the floor with all-purpose surface cleaner and then wipe it down with a damp microfiber mop. There’s no need to spend hours on this step. Use a damp microfiber cloth to wipe down the outsides of appliances in your kitchen. You’ll need extra time to do this, but it’s worth it. Mix together a solution of three tablespoons of baking soda and four cups of warm water. Use it to wipe down the insides of your fridge and microwave. Use the oven’s self-cleaning function to make it shine inside. If you have wood cabinets, use wood cleaner to spruce them up. Otherwise, use water and dish soap. The main thing to worry about when cleaning the family room is clutter. People tend to congregate here, and their things do too. Unlike the kitchen and the bathroom, there’s not a lot of scrubbing involved. Using a laundry basket, go around the room collecting things that don’t belong. Go around the house putting things in their proper places. This step alone should improve the appearance of the family room by a significant degree. If you’re not careful, the surfaces in your family room could become coated in dust. Keep an electrostatic cloth or a microfiber cloth handy and use it to dust the family room thoroughly. Make sure to wash these cloths regularly too, or they won’t be very effective for dusting. Don’t forget about ceiling fans and other hard-to-reach places where dust remains hidden. Out of sight isn’t out of mind because dust can creep out into living spaces easily. In most cases, you should be able to get away with fluffing pillows and shaking out and folding throws. Every now and then, though, make sure to throw them in the washing machine if possible. This will help to keep them fresh and cozy. When pillows and throws become too worn out, don’t be afraid to replace them. Fresh throws and pillows can make a huge difference. At the absolute minimum, you should try to vacuum or dry mop the floor in your family once per week. This will go a long way toward keeping dust, dirt and debris at bay. In a pinch, at least dry mop or vacuum the area near the outside door, which is where most of the dirt gets into the home. Using the brush attachment on your vacuum cleaner, clean the upholstery and window treatments in your family room. This will clear away a lot of dust and leave the room fresh and clean. When you have a little spare time, use an eraser sponge to clean scuffs off of the walls. A damp sponge can be used too. Use glass cleaner to wash the windows. Use a lint-free cloth to prevent streaks. The bedroom is usually the easiest room to keep under control. At least, that’s true about adults’ bedrooms; kids’ bedrooms are a whole other story. If you don’t have time to change them completely, shake out your sheets and spritz them with linen spray to freshen them up a little. Keep a clean set of sheets handy so that you can change the sheets quickly when needed. Quickly use a damp cloth to dust surfaces around your bedroom. In the case of wood tables, dressers and other furniture, use wood cleaner. Once again, you don’t want to overlook the floors. Try to vacuum or dry mop the floors in your bedroom at least one time per week. Resist the temptation to shove things under the bed. Even if nothing is under your bed at all, you should periodically vacuum or dust beneath it. Moving the bed isn’t practical, so use an attachment to get in there easily. You can also use a dry mop with an electrostatic cloth to clean beneath and behind the bed. Although it may not be a top priority, it’s wise to clean the walls, windows and lights in your bedroom from time to time. As far as light fixtures go, take them down and clean then with all-purpose surface cleaner. Dust ceiling fan blades thoroughly. Use an eraser pad to clean scuff marks off of walls, and use glass cleaner to wash the windows. Once a year or so, remove screens from the windows and clean them thoroughly as well. Don’t forget to use a vacuum attachment on window treatments from time to time as well. Closets can harbor all kinds of dust and debris. Over time, they can also become black holes for certain items of clothing. At least once per year, take everything out of your closet and organize it all. While everything is removed, dust shelves and racks and vacuum or dry mop the floor. Donate unneeded items and replace everything else as neatly as possible. When you consider this whole list of chores, it’s easy to feel completely overwhelmed. However, you should just move through the list when you have the time to do so. You’ll be amazed by how much you can accomplish with just a few spare hours per week. By keeping up with these tasks, you won’t have to devote your weekends to cleaning your entire house.